Château de Grasse is a stunning 19th century château, built by an esteemed perfumier as a private palace in Grasse, the world capital of perfume. This property is a truly outstanding gem, even amongst the glitz and glamour on the French Riviera. Hidden within a beautiful 3 hectare park, boasting ancient palm trees, this property was a beloved holiday destination of Queen Victoria's. 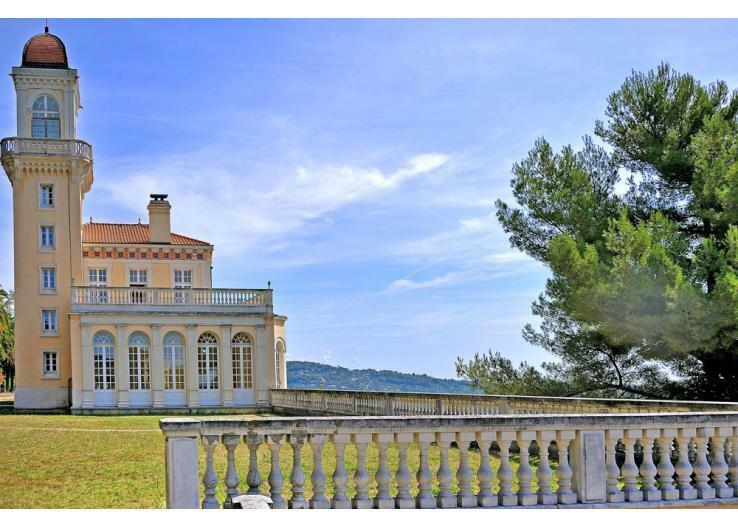 Built in the 19th century by an esteemed perfumier as a private palace in Grasse, the world capital of perfume, Chateau de la Victoire is a truly outstanding gem even amongst the glitz and glamour of the French Riviera. The chateau is settled within a glorious 3 hectare park lined with ancient palm trees and was a beloved holiday destination of Queen Victoria, surely an undeniable testament to the regal credentials of this property. To stay here is to live like royalty in your own private palace. Every inch of this huge chateau has been finished to an exquisite standard, and the interior is flooded with sunlight that pours in through vast original windows. Spiral staircases lead on to polished marble furnishings and flooring, ornate taps appear like trophies above sinks and large stone bathtubs, gold-leaf detailing, intricate wood parquetry and traditional artworks decorate the walls and high ceilings. Downstairs the large indoor heated pool room is reminiscent of a Roman spa complete with mosaics, yet another element of the timeless luxury of this property, it offers a jacuzzi, sauna, steam bath, massage rooms, work-out room, changing room and even a bar area. Guests can congregate on the terraces and take in breath-taking views out across the Plaine de Grasse, or you may choose to dine inside under the crystal chandeliers. There's plenty to see and do in the area, from walking to shopping in Grasse. Most nightlife is centred around Cannes. Château de la Victoire offers 7 bedrooms with 6 en-suite bathrooms for up to 14 guests. Breakfast will be served in “The Conservatory”, where you can take in the panoramas of Grasse. End of stay clean included. - Concierge living on the property - separate building. Not suitable for elderly and infirm or possibly small children as there are a lot of marble staircases to negotiate. Use of a car is strongly recommended.